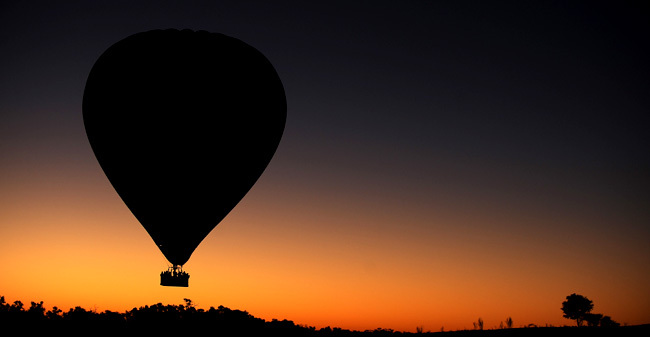 We are caught between the cusp of a new day and the last flickers of night, strangers pressed together in a wicker basket, suspended 1,000 feet above the ground in the center of Australia. In the pre-dawn silence, before the birds awake, the sun sends tentative golden strands across the red dirt until it glows like an ember. Its radiant tentacles stretch out slowly as they have done for millennia, highlighting desert features of oaks and mulga scrub, rock wallabies and craggy outcrops. On the opposite horizon a sleepy full moon melts down like an egg yolk behind the rugged outline of the MacDonnell Ranges, leaving the sky silvery blue in its wake as we’re carried along on the wind. All our fears and concerns for the world below and the flimsiness of our wicker basket seem to dissipate as the pilot pumps the burners to send jets of orange, blue and white hot propane into the balloon. We float aimlessly, unaware of our progress. There is no airspeed, no aerodynamic lift, no vibration and no wind noise. We cannot pitch or roll. It feels more like gently levitating than flying. Out here, the land is a jumbled stretch of rocky outcrops and hills that appear much larger and farther away than they really are. We’re floating above one of the most isolated and arid places on earth, a place where you can wander far into the horizon and not see another soul. Where all there is for company is the melancholy call of a lone crow, the crunch of your feet in the never-ending dirt and the gentle wail of the breeze. Mile after mile of river and creek beds wind their way through the parched land. The “Floodway” signs that appear at regular intervals along the highways seem ludicrous. The waterways that snake through the landscape are a mocking reminder of the thundering rains that will surely come. We’re surprised when the basket bumps and scrapes along the ground, sending puffs of ochre-colored dirt into the air. We’d hardly even noticed our descent. And the whole thing ends perfectly… with honey-glazed chicken drumsticks, quiches, fresh fruit, cheese, and chocolate cake, washed down with fruit juice or champagne. 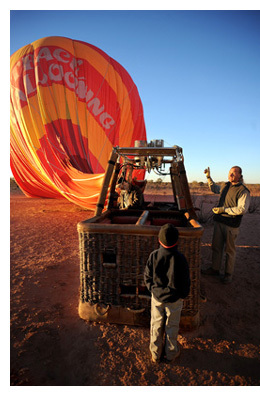 You’ll be picked up and dropped off at your hotel by Outback Ballooning. 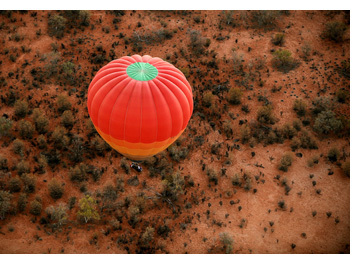 Qantas has regular flights to Alice Springs from most Australian cities.